An illustration of the different positions in a baseball game. 1. P: Pitcher. Pitcher is referred to as Position 1. 2. C: Catcher. Catcher is referred to as Position 2. 3. 1B: First Baseman. First Baseman is referred to as Position 3. 4. 2B: Second Baseman. Second Baseman is referred to as Position 4. 5. 3B: Third Baseman. Third Baseman is referred to as Position 5. 6. SS: Shortstop. Shortstop is referred to as Position 6. 7. LF: Left Fielder. Left Fielder is referred to as Position 7. 8. CF: Center Fielder. 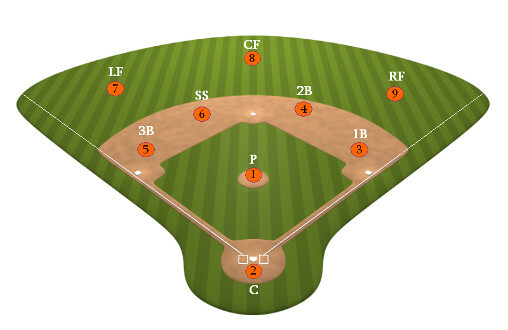 Center Fielder is referred to as Position 8. 9. RF: Right Fielder. Right Fielder is referred to as Position 9. Corner Infielder: Refers to a player who is either a First Baseman or a Third Baseman. Middle Infielder: Refers to a player who is either a Second Baseman or a Shortstop. Relief Pitcher: A pitcher who enters the game in relief of another pitcher.